Back Row (L to R): Cormac Enright, Stephen Slater, Tom Hanrahan, Jamie Organ, Conor Moloney, Jamie Ryan, Billy Ryan, Alan Tobin. Middle Row (L to R): John Gorman, Eoin Brackett, Brendan Walsh, David Shanley, Stephen Lanigan, Stephen Enright, James Phelan, Dan Shanahan, Joe Power. Front Row (L to R): Brian Beatty, Ciarán Mitchell, Richie Ryan, Patrick Bergin, James O'Mahony, Seán O'Hare, Jason Healy, David Power, Donal Henley, Johnny Burns. 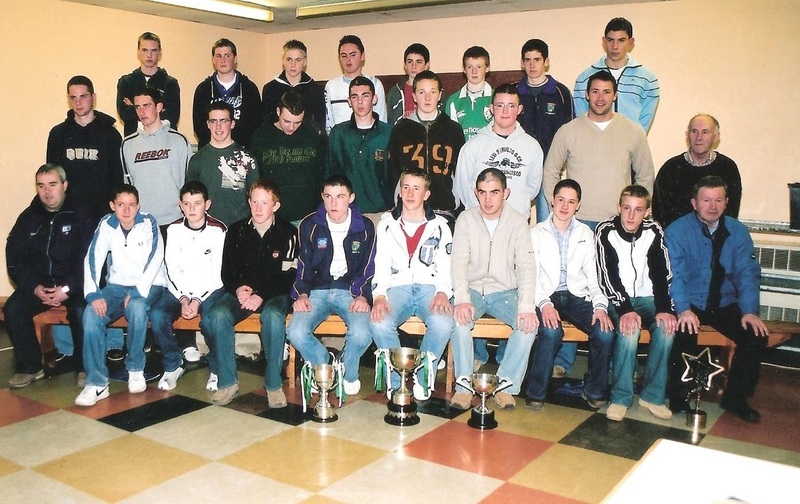 This week's photo comes from 2004 and shows the medal presentation held in St. Augustine's College to the Ballinacourty U16 Footballers who won the Western and County titles that year, retaining the competitions won the previous year. Waterford All-Star Dan Shanahan was the guest of honour on the night.